These where two long days. I saw some great presentations and some that were not. I have made some session reports for you, I will skip the lesser sessions. 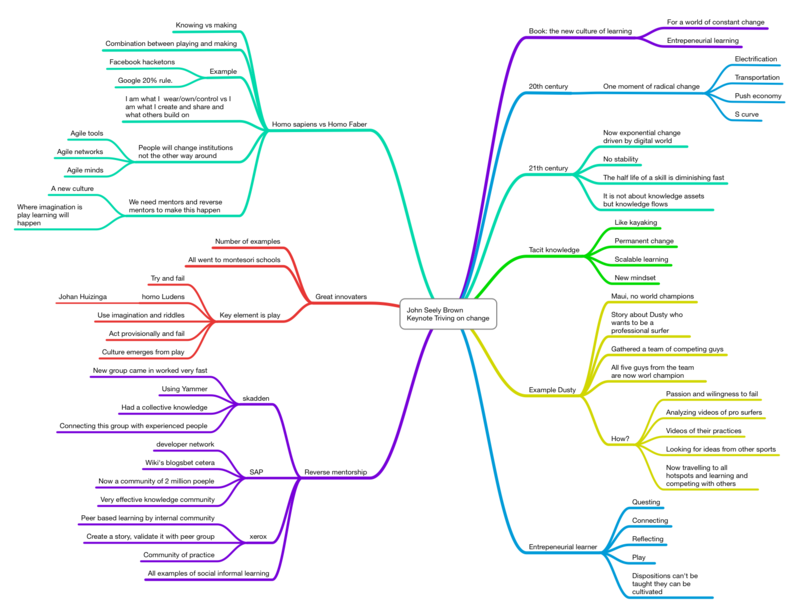 From most session I created a mind map: click on the image to enlarge it. The opening keynote on Monday. I have to say I was impressed. I know him of course of his great TED-talks and other presentations, this was the first time I saw him live. From the on-line talks I know that he is opposed to our educational system (and I have to agree for a large part). In this keynote he had a more positive but very simple message: Talent is buried under the surface and it needs to be discovered. Talent can only brought to its full capabilities when it is accompanied by passion. That doesn’t sound as a lot for a talk of one hour, but it was great. he is a great speaker, he was relaxed, funny and he improvised. I guess you had to be here to really appreciate it. The keynote on Tuesday was delivered by John Seeley Brown. Another interesting presentation but quite complex. He proved to us that change is happening at an ever increasing pace and that the current digital developments will change everything. It will turn learning upside down. And we have to find new ways for that. Reverse mentoring and Play are key elements in his solution. Interesting but he gave so much information that I have to process it further before making up my mind. 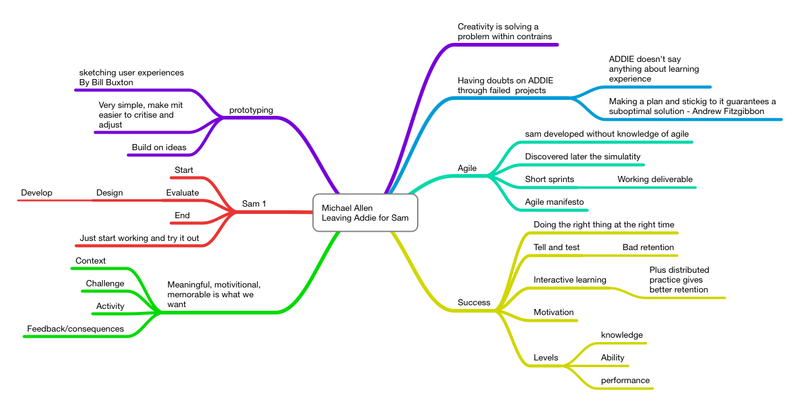 I wrote post on his book and agile development and I loved his presentation. There was no seat left in the room and for me he added extra insight to the book with this presentation. Loved it. Amy Kirkpatrick – implementing the improved Kirkpatrick modelA good presentation outlining the changes in the model to keep it up to date. They have flipped it, starting at level four, in order to ensure the connection with the business goals. Level 1 and 2 are now combined. Can’t help wondering if a renovation like this will keep it relevant. I lost a part of my notes, mainly the part where she explains the ‘old’ model. 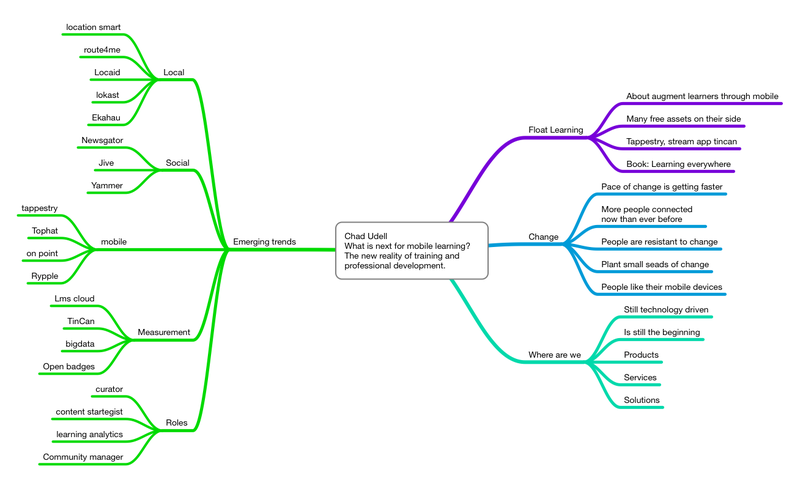 So I will present what is left of my notes. Chad gave us a great overview of what is happening in mobile right now. I expected a bit more from him, giving more guidelines and directions to the audience of which steps to take. Nevertheless an interesting presentation.